Can you identify the subtle differences in the two birds? What follows might astound you (or maybe not), but friends, nay, even family members have called me a bird nerd. I confess. I don’t mind the moniker. I even bashfully call myself a birder, although my hobby only started four years ago. I think of birding as an anti-Alzheimer’s project to keep my aging brain nimble with new information and my body young (because one must hike great distances to find the rarest birds). I spent Labor Day weekend on a solo trip to very southern Arizona in search of new-to-me and rare-for-the-US birds. I know. It may seem like a waste of resources to some, but every time I seek rare birds, I usually end up find much more than I bargained for. 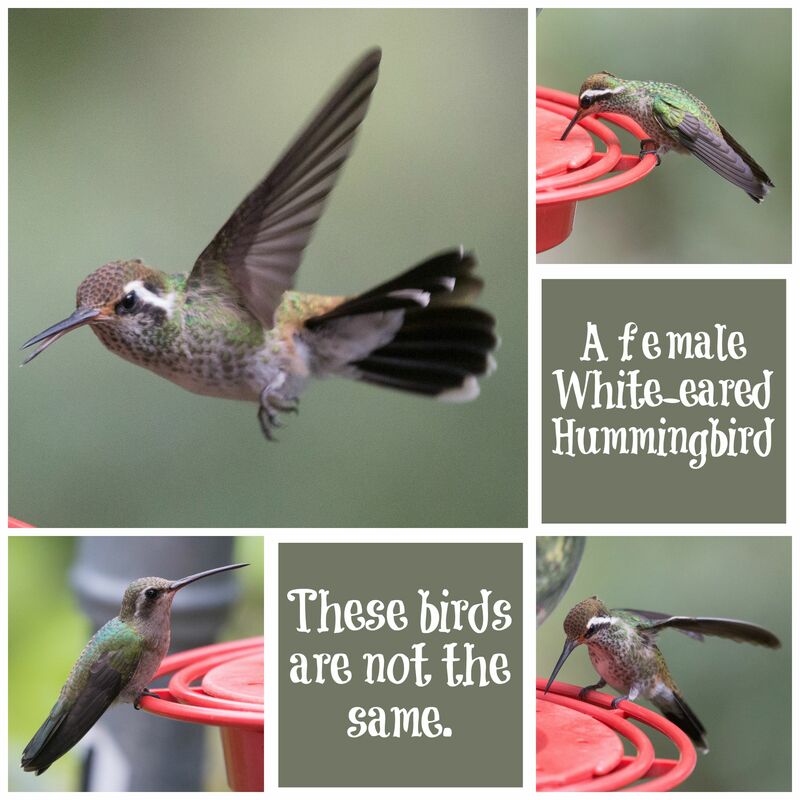 As I sank into the benches at the Beatty’s Guest Ranch (don’t laugh, but many birders open their homes or business to other birders who want to come and enjoy their yard ‘pets’), I hoped that this time I would see the elusive White-eared Hummingbird. They don’t show up very often on this side of the border, but one had shown up sporadically all summer long at this very location. I sat alone on a quiet, overcast morning, and worried about whether I know one if I saw one. A bird with white behind its eye (thus the ‘white-eared) zoomed in to a feeder behind me and I started snapping photos. When it zipped off, I looked at my photos and couldn’t decide if I had seen the rare bird or not. It LOOKED like it COULD be a female. I studied it closer. The beak looked a little long, and I hadn’t gotten a good shot of the chest of the bird—which should be white. I repeated this exercise for twenty or thirty minutes. My fingers hesitating over my bird log app—not wanting to report incorrect information, yet wanting so badly to be able to say I saw one. A hummer buzzed low over my head and settled three feet above me on tiny twig, too close for my telephoto lens to capture. A White-eared Hummingbird! A real one! Obviously different from the one I had been almost sure about a few minutes earlier. I held my breath and hoped she would alight on a feeder—preferably one in the correct range for my lens. I held my DSLR in one hand and my iPhone in the other, just in case. Thankfully, she moved. I snapped twenty or so photos with my camera before she flew away. I pulled up the photos on my camera and compared them to the ones on my bird app. They were exactly the same! When I arrived home and compared the photos of the maybe bird the real bird, I could clearly see that they were not the same. But, oh, how often have I acted the same way in real life. The younger me wanted to be in love so badly that I mistook real love for casual interest. I wasted countless hours agonizing over a relationship (or two or three or four) that seemed to have all the potential to be ‘the right one’, but never seemed to pan out. Only later, under careful scrutiny, did I realize how wrong those relationships were—how the seriousness existed more in my mind than in reality because I wanted to check an item (fall in love/get married) off my list. My excitement when I saw the real deal bubbled over and I wanted to shout and jump for joy (I’m talking about the bird here, but it happened when I discovered true love, too). I quickly sent out an email to the bird nerd list serve (yes, my problem hobby runs deep) so that others would know that the White-eared hummingbird had put in an appearance. I love it when God reminds me, in gentle, beautiful ways, to slow down; to spend time observing and studying the real deal—his word—before I rush into decisions and start spouting off to others.